It’s close. I can feel it. Forget what that stupid groundhog “said”. Spring is almost here, and it’s time to swap comfy sweaters for tees and tanks. I know the lows are still trying to break 50, but I don’t care; close enough for me. I’m changing my closet. If the excitement alone of switching from winter to summer isn’t enough, here are a few tips to make the transition fast and easy. 1. Unless your closet has room for a chaise, space is a commodity that can’t be wasted. Closet changes are a perfect time to make a donation pile. If you didn’t wear it all season, it’s time to let it go. 2. Start from scratch. Empty out drawers and clear hangers before bringing in the summer wardrobe. Make sure to hold back a light sweater or some tights for a cool night or layered look. 3. Pack smart. When old man winter returns, you won’t want to fill your closet with a wrinkled wardrobe. If this advice is a season too late, a bottle of Downy Wrinkle Releaser Plus will smooth things over. If the wait for warm weather is too much or you’re counting the days until Spring Break, the 3 oz travel size Downy Wrinkle Releaser Plus keeps you from looking like your outfit just came out of a suitcase. Don’t let your dash for sun cost you style points. What’s your secret to a quick change seasonal switch? Post a tip or pic of your HGTV^™-worthy closet on our Facebook page. 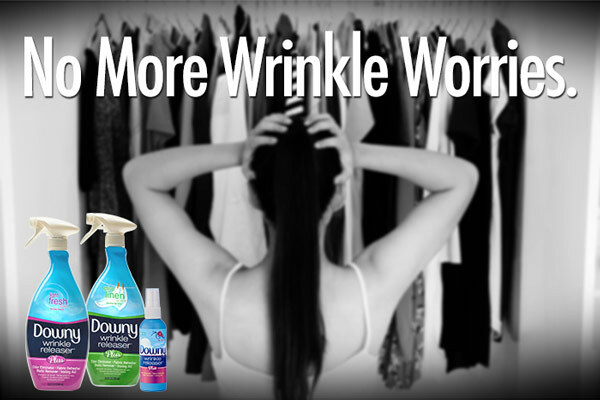 Wowing the crowd could be worth a little something from your friends at Downy Wrinkle Releaser Plus.